The ultimate bearing capacity of a foundation can be determined from the load–settlement response obtained from plate load tests. For clayey soil it is known that the ultimate bearing capacity of footing is equal to that of a test plate. However, the present study shows that it varies with the variation of type of loading, size and shape of test plate and soil consistency. For reaction type of loading, the load is observed as normally distributed random variable with an average co-efficient of variation of 0.018. For different shape and size of plates, the bearing pressure–settlement curves show a high degree of variation. Subsequently the bearing pressures and settlements are normalized to dimensionless parameters and the normalized plot shows a reduction in variability. Further, the normalized curves are fitted to the hyperbolic model by nonlinear regression with non-constant variance. The model parameters, their standard errors, 95% confidence intervals and co-efficient of determination are quantified. The horizontal asymptote of the hyperbolic model has been used to estimate the ultimate bearing capacity. This method yields a value very close to other conventional bearing capacity methods. A sensitivity analysis shows the influence of various parameters on the bearing pressure. 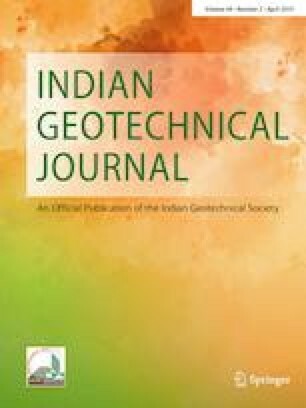 The authors are thankful to Prof. G. L. Sivakumar Babu (Professor, Indian Institute of Science Bangalore) for his suggestions in writing this paper. In this section, it is shown with an example, how the load–settlement response of a larger plate (or footing) can be estimated from the load–settlement data of a smaller plate. Let us consider the data from the test 0.1 m sq.(1). While fitting this data in the hyperbolic model in Eq. (1), following model parameters are obtained a = 0.31, b = 0.03 (From Table 3). Let us consider these to be the point estimate of mean. From Table 4, C.O.V. of a (δa) = 0.23 and C.O.V. of b (δb) = 0.58. For the 0.1 m wide square plate, the actual data points, hyperbolic model and the ± 1 σ curves are shown in Fig. 15a. Now let us estimate the load–settlement response of 0.45 m sq. (1) from the above result. For 0.45 m sq. (1) test, B = 450 mm and qu = 18.9 kPa. Using these values, the predicted bearing pressure–settlement curve is obtained as shown in Fig. 15b. It is observed that the actual curve obtained from PLT on 0.45 m wide square plate is very close to the model curve. The bearing capacities obtained from both the tests are also giving similar values. Hence, this method is producing a very good estimate of load–settlement response and bearing capacity of 0.45 m square plate from the 0.1 m square plate load test data.